We just ran across a scam on Facebook that we haven’t seen before, and while it didn’t trick us, it did not immediately come across as a scam. Important note: If you do encounter something similar to this. Do not click the link, and make sure to communicate with everyone who is an admin or editor on your Facebook page. 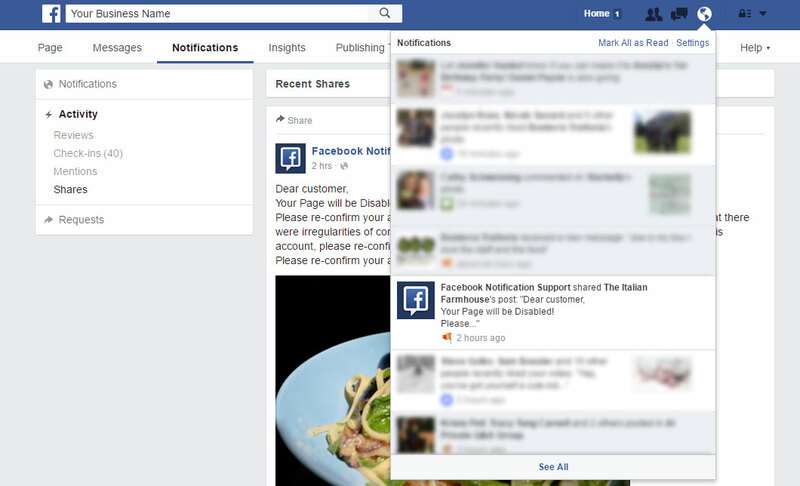 You’ll get a notification (see the image below) from “Facebook Notification Support” or some similar name to that, telling you that your page will be disabled. No one wants their page disabled, that that is what made us investigate further. The message looks official enough, but more importantly it comes to you as a notification, not a private message, or a post. Once you click on it, you are taken to a notification page with further information (see the image below). A threat of your page being disabled is made, and a request to confirm your account information is placed below that. What caught our attention about this scam is that it comes in as a notification. Someone has shared your post, and put in threatening text, which ends up coming back to you. In addition, you can not delete a share notification. So it is impossible to remove this “recent share”. This increases the chance of an accidental click, espeically if you have a number of Facebook Page administrators. If someone were to click the link and enter any information requested – that user not only risks unauthorized access to their account, but also any pages or groups they edit or administrate. This access could enable an unauthorized user to post spam content to your page, which, at the least could make people unlike your page, and at the worst your page could be deleted. Time is very important: Who ever provided the access information needs to immediately change their Facebook account password. If that password was used anywhere else, it must also be changed. 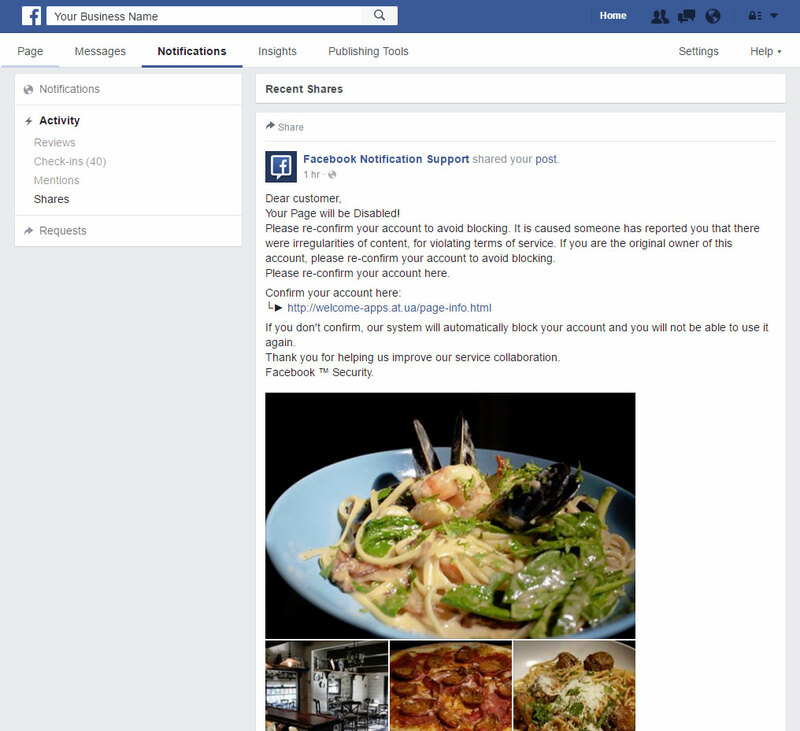 If you lost access to your account, visit this Facebook support page.